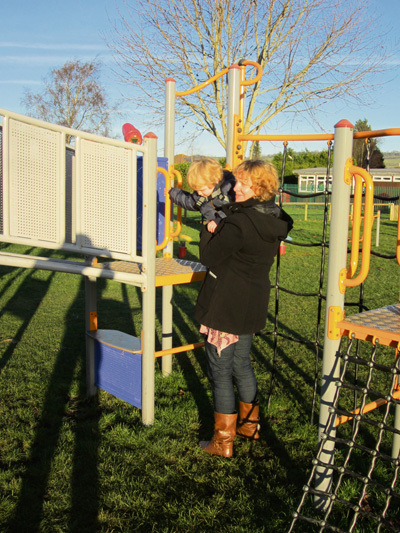 A parish councillor has backed calls for improvements to make a Saltford play area more toddler friendly. Some of the equipment at Manor Road Play Area, near Anson Close, is not accessible for younger children, it is claimed. The issue has been raised by grandmother Lynne Davies, pictured, with Councillor Duncan Hounsell, who has put the matter on the agenda at this month’s parish council meeting. Lynne Davies said: “There are a number of problems that could be improved without spending a lot of money. The climbing frame/slide is not accessible by my grandson and once he is lifted on there is no bridge for him to move from one end of the apparatus to the other. The concerns have also been raised with Bath and North East Somerset Council, which is responsible for the play area.